1. Provide the heavy radial load carrying capacity as well as the high rotation speed. Cylindrical Roller Bearings are bearing in which cylinders are used as the rolling elements as opposed to balls in ball bearings. As such, the rollers have a greater (linear) contact area with the outer ring and are distribute loads across a broader surface. Subsequently, they have a relatively high radial load capacity and are suitable for high speeds. Double-row cylindrical roller bearings have high radial rigidity and are used primarily for precision machine tools. 2. Available in various types, N, NU, NJ, NF, RN, RNU, etc. Also available in double row and four row types. WD single row cylindrical roller bearings, caged, mainly of the NU, NJ, NF, NUP and N designs. WD double row cylindrical roller bearings, caged, mainly of the NNUand NN designs. 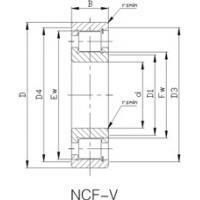 WD single row full complement cylindrical roller bearings, mainly of the NCF and NJG designs. WD double row full complement cylindrical roller bearings, mainly of the NNF design. Types NU, N, NNU, and NN are suitable as free-end bearings. Types NJ and NF can sustain limited axial loads in one direction. Type NUP can be used as fixed-end bearings. 3. Optimized design in the rollers and raceway, reduce the stress and enhance the lifetime. Particularly suitable for support end shaft. The rollers of WD cylindrical roller bearings are key components. Their geometry, the so-called logarithmic profile, provides an optimum stress distribution in the contact zones in the bearing. Their surface finish maximizes lubricant film formation and optimizes rolling motion of the rollers. The benefits derived from this compared with traditional designs include enhanced operational reliability and a greater insensitivity to misalignment. 4. Low noise design, reaches to V1 grade noise level, contributes to the quieter running of automobile engine and gearbox. WD cylindrical roller bearings have excellent performance in noise control. The normal bearing noise is under 65DB. And they are widely used for automobile engines, gearboxes and precision machine tools. In some special application which requires extreme low noise, for example, air compressors, WD successfully controls the bearing noise under 35DB. Applications: Automobile gearbox, Air compressor, eletric motor, etc.